InicioRestorative Dentistry Procedure for Bringing Back Your Smile! Implants are an ideal means to replace broken teeth. This is a permanent solution for tooth loss. Implants are in fact artificial tooth which is used by a restorative dentist to replace missing tooth/teeth. Missing teeth can cause lots of difficulty while chewing food, talking properly and most important of all, smiling broadly. Implants are attached to the jawbone underneath the gums for providing support to dentures and tooth bridges. 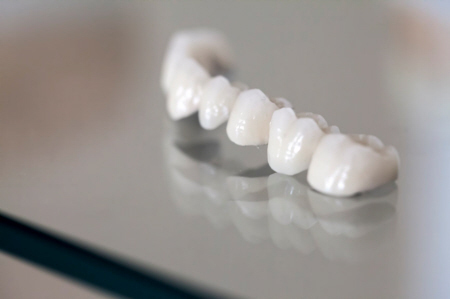 Bridges are the ideal solution for filling gaps, which appear due to missing teeth. As the term itself implies, a dental bridge bridges the gap due to missing teeth. Dental bridges are made up of a false tooth held together by two crowns. The false teeth are known as pontics. These can be made up of alloys, porcelain or gold as wanted by the individual. This is another restorative dentistry procedure which can be adopted for restoring broken or decayed tooth. Sometimes a tooth can become decayed or broken, but the root can still be in perfectly good condition. Dental crowns are the perfect solution for individuals facing this condition. Dental crowns provide a covering for the entire broken or decayed tooth which is above the gum line to give strength to the broken teeth. Veneers are best source to correct broken, chipped or cracked teeth. Thin wafer like layer of porcelain is used to bond the cracked or broken portion of the teeth. The bonding can be done both chemically and physically as well. The porcelain veneers available these days are very thin and natural looking. No one will recognize that the bondings are artificial. Of course unless you tell someone, there is no way to find out. This is another means to correct dental defects. Porcelain crowns are a type of restoration which can be used for covering the portion of teeth which has dark metal color fillings. The dark fillings in teeth look very ugly when a person smiles broadly. Porcelain crowns can be used for covering such dark colored fillings.